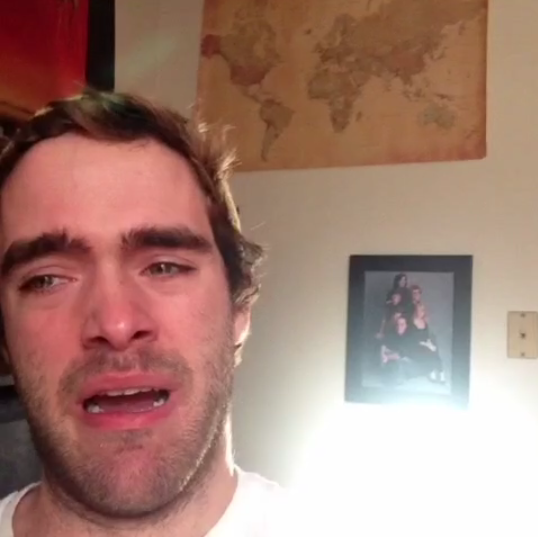 Nathan Enick cries about his lack of money for chicken nuggets in his most popular vine. One switch of his camera to selfie mode, and Pitt student Nathan Enick becomes someone else. He’s Sherri, the neighbor who loves to brag about her exceptional baking skills while casually showing off her artisan baguettes. Or he’s Will, the roommate who only sees the light of day for emergencies but is strategically absent when anyone brings up the topic of rent. Enick houses his crowd on Vine, an iOS and Android app that gives creators six seconds to make a looping video and share it with the world. Users can choose to shoot their clip in a single shot, or break it up into smaller frames, allowing the app’s users to create a joke and deliver a punchline in a fraction of a minute. Under his username @ayitspnayo, the senior bioengineering major has grossed more than 300 thousand followers and 300 million total views on his vines since he began posting on the app in 2013. Enick gained his popularity by taking moments from his everyday life and turning them into bits of observational and character comedy for his viewers to enjoy. Enick’s vines are composed of quick cuts and dialogues between his characters. The stories start with the camera on Enick while he switches between frames to represent different characters and delivers his punchline within the six-second limit. If Enick is recreating a moment from his childhood, you’ll find him in the bottom of the shot, looking up as if he’s looking at an elder. A frame switch later and Enick is at the top of the shot acting as an older relative or parent and looking down at the younger version of himself. Beyond the wild characters, viewers love Enick’s content because they can relate to it. Of the thousands of comments left on each of Enick’s vines, many read, “This is so me.” A vine he posted last month that garnered more than seven million views shows him calling out, “It’s finals week, you know what that means,” followed by him howling at ambulances for help on the corner of Lothrop Street and Fifth Avenue. Enick’s time at Pitt may be coming to an end, but his love of comedy and creation are far from over. Enick recently talked with The Pitt News to share his history with the app, how he finds inspiration and his post-grad plans. The Pitt News: Why and when did you first download Vine? Nathan Enick: I downloaded it the year it came out, which I think was 2013. I downloaded it then just because all of my sisters and my brother downloaded it then, and they were all making really funny videos. I joined on and played around with it for a little. I kind of watched people make videos for a really long time. I eventually started making my own regularly in the summer of 2014. TPN: How do you come up with ideas for your vines? NE: I’ll sometimes write down ideas as they come to me during normal conversations with people. Usually what I make either comes from real life situations that have happened to me, or I’ll just go on camera for 20 minutes or so and just say whatever. Eventually it’ll turn into something completely bizarre and unexpected, and usually I’ll just go from there. They’re either preconceived or off the bat. TPN: Do you have any inspirations for your vines? NE: Cody Ko (@CodyKo) is my inspiration on Vine and my favorite Viner. He’s done really cool stuff with timing and framing. I love his style. I take a lot of inspiration from Kristen Wiig. She’s my favorite actress, and she’s amazing. I like to take inspiration from my childhood. As I’m entering adulthood, I have new perspectives on things I did as a kid that I didn’t realize how crazy they were. It’s kind of fun to reanimate them with a different perspective. TPN: When did you begin to see a major increase in your followers? NE: I remember throughout the fall of 2014 it was steadily increasing by about 200 people a day. I started making vines where I cried in them and I made two vines, one about chicken nuggets and another one saying, “I’m not crazy.” Right when I made those, my follower count started going up by 1,500 people a day, which was completely absurd to me. That projection remained consistent throughout March of 2015 until I started decreasing my frequency of posting. TPN: How has Vine affected your life at Pitt and at home? NE: It’s given me a way to express myself in a way that I really hadn’t done before. I was in engineering and also on a pre-med track, so I really just didn’t have time to be creative. The format of the application is pretty generous in terms of time needed to make something. In terms of how it’s affected my life at Pitt, people will reference it to me every now and then. Sometimes people will come up and say hi. It really hasn’t affected my school at all. It seems to be pretty much the same. If anything, people would know me first through that application before meeting me in real life. I try to minimize that by not making any references to my Vine account so people discover it for themselves. It’s always the worst whenever someone will put up my videos in front of me and watch them and I’ll just have to run away because it’s too embarrassing. TPN: Have you met other people through Vine? NE: Yes! I went to a meetup in April between a bunch of creators from the application and we all met up in New York City and hung out. I was expecting to meet about four people because that’s how many people I was talking to. I got there and there were 60 faces that I recognized from the Internet all in a bar in New York City. Every single person there I had known only through Vine, so it was a very overwhelming and interesting experience. It was so much fun, though. It was awesome meeting everybody whose content I was being inspired by and watching and laughing at and for the past six to seven months. Seeing a lot of them in person was just really nice in general. TPN: Have you ever been contacted to collaborate with other users or do a promotion for a business? NE: Yes. People have offered me money to do collaborations and promotions, but I haven’t done it yet. Right now, I just want to focus on making content for the sake of making content. That’s how it started out, and that’s how I want it to continue until I get to a point where that’s more of an option for me. I don’t want to mess up my creative process by taking money for it. TPN: Has Vine played any role in your future plans? NE: Vine has reminded me how important my creativity is to me just in terms of what I decide to do professionally. I originally was gearing toward medical school, but I’m also realizing how important content creation and comedy is to me as well, because I could literally spend all day just making comedy videos and coming up with jokes. I’m about to do a film internship at Pittsburgh Community Television this upcoming semester for practical experience in the industry. It’s something I might try to tap into after I graduate instead of sticking with bioengineering solely. TPN: Why Vine? What makes it different from other mediums? NE: It’s very easy to consume a lot of media on Vine just because everybody’s content is so short. You can very quickly see whether you enjoy someone’s content or not, you don’t need to watch a seven-minute YouTube video. In terms of making content, it’s nice because there’s a time limit, so I’m not allowed to spend extreme amounts of time making content for a longer video. It has to be six seconds long, so that provided me with a lot of liberty in terms of time. The time limitation is also a challenge because it’s hard to set up a joke and then deliver a punch line all within six seconds, but that’s kind of been a fun creative challenge as well. TPN: Are you the same person in real life as you are on Vine? NE: I feel like that depends on how people see me. When I met people in New York City, I was told by other creators that sometimes they’d run into people who turn out to be very different than how they act in real life, but I was the exception to that rule. I think in general, I’m pretty much the same person. I think I’ve gotten that from more than one person. Most people who I talk to at school also say that I’m pretty much the same person. Vine is just an extension and concentration of my personality.